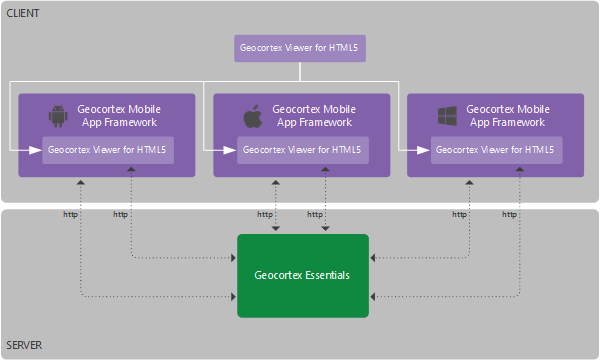 The Geocortex Mobile App Framework (GMAF, the App) is a native client application that can run Geocortex Viewer for HTML5 (GVH) viewers without network connectivity. It is intended to be installed and used on a mobile device such as a smartphone, tablet, or laptop. The Geocortex Mobile App Framework supports Android devices, iOS devices (iPad, iPhone, and iPod Touch), and Windows tablets and computers. The Geocortex Mobile App Framework allows the viewers to access native device capabilities like the file system in order to access large basemaps while the device is offline. A typical usage scenario is a user with a mobile device who needs to access a GVH-based viewer in the field, where the device may lack network activity. Before entering the field, the user must first install the Geocortex Mobile App Framework on the device and configure offline mode for the viewer. After returning from the field, the user can synchronize any changes made using the App while the device was offline. Store and display GVH-based viewers in a menu for easy access. Enable access to native device capabilities such as the file system. Wirelessly download and store basemap (TPK) files that can be used with GVH-based viewers while offline. Enable access to large offline basemaps. Provide offline geometry service functionality, like projection, simplification, and measurement. Provide offline editing of feature data and two-way synchronization of that data. The Geocortex Mobile App Framework for Android supports Android 5.0 and newer on tablets and phones with at least 1 GB of RAM. For more information, see System Requirements for Android. For more information, see System Requirements for iOS. For more information, see System Requirements for Windows. Single viewer: Automatically launches a single application. This is ideal for focused single-task workforces. The Geocortex Mobile App Framework for Windows does not support multiple single-viewer apps on the same device. Multi-viewer: Presents a list of viewers on startup allowing a user to switch between multiple viewers. This is ideal for workforces that do a variety of tasks. For a comprehensive list, see Offline Support for Services and Features.